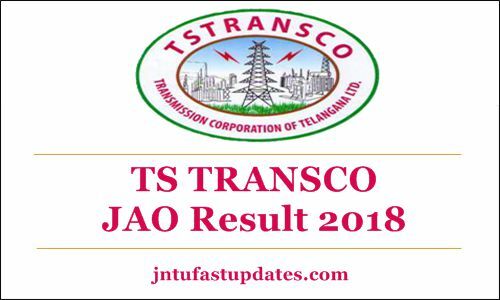 TS Transco JAO Results 2018 & Merit List, Cutoff Marks: Transmission Corporation of Telangana Limited, Vidyut Soudha, Hyderabad (TSTRANSCO) Junior Accounts Officer (JAO) written test attempted by a huge number of competitors in recent times. Aspirants deserved to get the Jr. Accounts officer posts have applied for the TSTRANSCO JAO posts and almost all the applicants have competed for the written test on 30th September as per the update from the organization. TSTRANSCO JAO Answer Key unveiled by the organization after a few days later the examination. Hopefuls who have done with the answer key verification and waiting for the results will have to wait for few more days. The TSTRANSCO usually releases the results within 3 to 4 weeks after the examination. Hence the competitors are required to stay patient until the result date is announced. Keep checking the updates from the TSTRANSCO website, tstransco.cgg.gov.in. Transmission Corporation of Telangana Limited, Vidyut Soudha, Hyderabad (TSTRANSCO) is the state level power supply division. This organization works for power supply in various areas and other related works in the state of Telangana. Every year, it releases various notifications to hire the suitable aspirants into various vacant positions. The organization has recently come up with a notification for 44 Junior Accounts Officer posts. The organization received a huge number of applications from the eligible aspirants. Candidates aspiring to get the TSTRANSCO posts have applied from 28th August to 11th September. TSTRANSO received more than 50K applications from the interested aspirants. The selection of aspirants will be done through written test and interview rounds. Candidates who secure good merit in the selection process will get the JAO posts in Telangana TRANSCO. Name of the Post Junior Accounts Officer – JAO. Candidates competed for the TSTRANSCO JAO Test, which has been conducted on 30th September can expect the result in the last week of October (tentatively). Aspirants have to wait to know the exact result date. TS TRANSCO will leave the updates on its official portal, tstransco.cgg.gov.in. Hopefuls can keep checking the portal on a regular basis. The cutoff marks/qualifying marks of the conducted examination will also be announced by the organization. To clear the written test round, candidates need to score the minimum qualifying marks in the test. The TSTRANSCO JAO Cutoff marks will be accessible category-wise, section-wise, and overall. Candidates have to get the satisfying marks in all scenarios to clear the written test phase. The TSTRANSCO Junior Accounts Officer Result link will appear on the homepage. (At the time of result declaration). The result and cutoff marks of TSTRANSCO JAO examination will appear on the screen. Municipal accounts officer notification expect cheyocha? After how many years we can expect next JAO NOTIFICATIONS? Date : 09.11.2018, 10.00 a.m. onwards @ Vidyut Soudha, Hyderabad. How can we get medical certificate? Provisional degree certificate is enough for certificate verification? Is any link provided? I couldn't able to find the link.!! Degree provisional certificate is enough for certificate verification? What is the recruitment process any idea? Candidates are called on toprank basis or cutoff rank basis?